Like all well-bred people, the family gave us some lovely presents, from their equally lovely homeland. My mother got an alpaca shawl. My dad a vicuna overcoat. I got a beautiful rosary-set, blessed by the Cardinal of Lima. 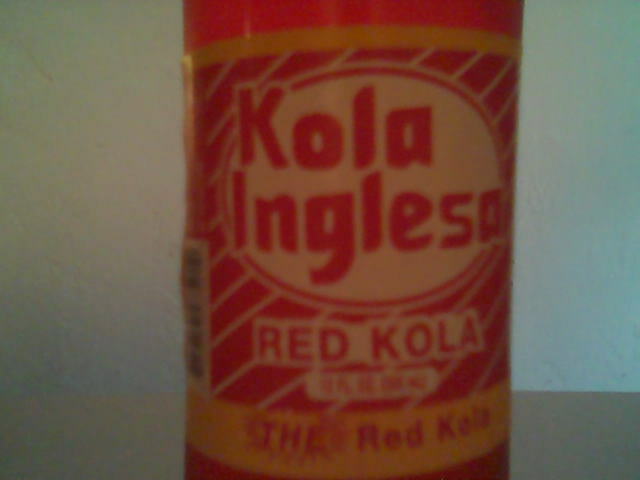 Kola Inglesa! English Coke? A red cola -- cool! Now, many people don't realise that Coke and Pepsi are not the only soda-pop around the world. ...but do you know almost every country has its very own local soft drink? 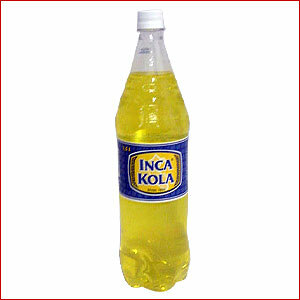 Peru has Inca Kola, which is a funny name to English ears, I grant you. This pop has a funny, rather coincidental history, since it was a family of British expats called Lindley, who settled in Lima in the late 19th century, and who were the inventors, and packagers of this monumentally popular soft drink. It's been described as looking like wee-wee, and tasting like bubble-gum, which is so not true. Well, the bubble gum bit, anyway. But, now with this never-before-tasted Kola Inglesa, I have a quandry. One which I will leave up to Sundries readers, to decide. ...or not even one, just keeping them with their caps on, as a souvenir? UPDATE: I took commenter Pete's advice, and served them to my guests, fully expecting them to ask for the English Kola at table. For whatever reason, out of politeness, lack of interest, or just forgetfulness, we ignored the Kolas, and thus, I still have a whole six-pack at my disposal. Now taking eBay bids! Starting price: $999 (reserve). If I were a visitor to Peru and I had brought my hostess a six-pack of Coke, I would be underwhelmed to have it served back to me for dinner. Especially when my hostess had made a game attempt to serve me a spread of Peruvian-ized American dishes and American wine. How awful to consider a taste of my native Coke to be the highlight of dinner! However, I might find myself delighted to see my charming hostess with the odd accent and cute freckles pop open a bottle of Coke for herself, imbibe, pronounce it the best ever with perhaps a wink and a thumbs up, and offer a serving to everyone present. I'm sure my wonderful hostess would be quietly confident that everyone else would be far too polite to take her up on her offer and she would be able to enjoy the rest of my gift at her leisure. Or pour it down the drain when no one was looking. This is America, keep them all and sell them on eBay, only first, etch what could look like the Madonna on each of them. Brings a much better price. Pour yourself a glass, over cubes, and sip away! Then let us know how it tastes. But don't serve it to your guests. If I were a visitor to Peru and I had brought my hostess a six-pack of Coke, I would be underwhelmed to have it served back to me for dinner. Two things struck me upon reading this. 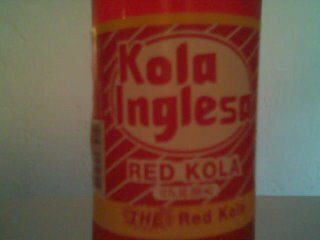 First, the whole point of them bringing us "Kola Inglesa" as a present, was because we're English, and they thought it would amuse us to see this "Coke" with this particular name. Especially when my hostess had made a game attempt to serve me a spread of Peruvian-ized American dishes and American wine. How awful to consider a taste of my native Coke to be the highlight of dinner! Well, no no, I didn't mean to imply that's ALL I would be serving. We had copious amounts of beverages to hand. Everything from Vouvray wine, to Argentinian wine, to Perrier for the kids. Keep reading for my decision. OMG! Mum, is that you? WELL! I decided to go with Peter's decision -- to offer it to my guests, and then imbibe one English Cola myself. But just like my plans for the beach and the movies, it didn't exactly come out right. I put the Kolas in the ice-buckets, alongside the other drinks, but no one asked for it -- even me! Nope, he's right (pun) on, I am and have always been left-handed, enduring the social elitism and outright discrimination of those less artistically inclined "rightys"; no offense intended. As for the adjective, perhaps. For instance, notice that I had to look the word up. I doubt I've been more highly complimented in my life. Thanks for taking my advice, Victoria. Now, can I advise you on purchasing some shares in an offshore tax-shelter that's just perfect for you?